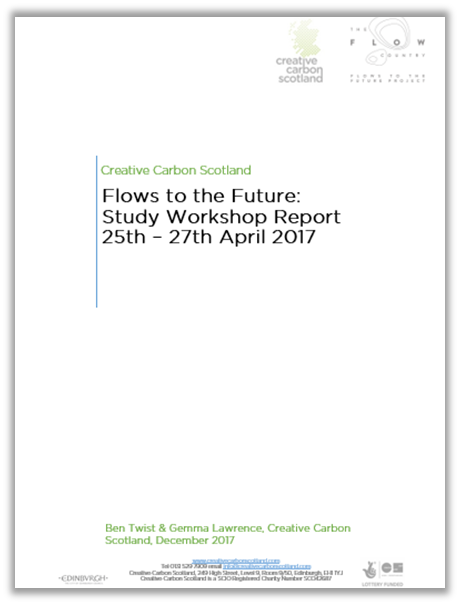 In April 2017 Creative Carbon Scotland collaborated with the Peatlands Partnership, led by RSPB Scotland on part of the Flows to the Future project, to deliver a two day study workshop exploring the role of cultural practices in contributing to the current and future sustainability of Scotland’s Flow Country. 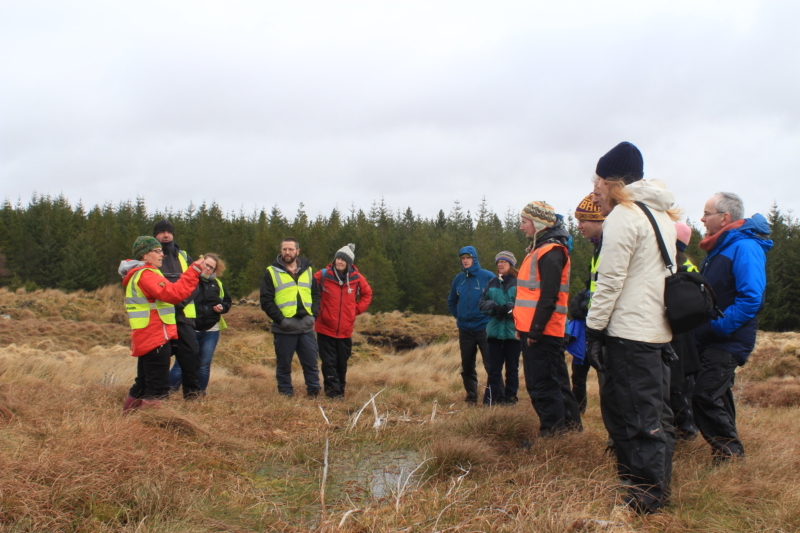 The workshop took place in the context of the Peatlands Partnership’s commitment to involve cultural practitioners in the Flows to the Future programme with the aim of widening awareness and promoting of the importance of the Flow Country. Flows to the Future (2014 – 2019) is an ambitious project restoring 7 square miles of blanket bog in the heart of the Flow Country that have been damaged by forestry planting. It also aims to promote and develop knowledge about the role of peat and carbon storage, and involve and connect people everywhere with this precious habitat, delivering real economic benefits for one of the least densely populated areas in Scotland. The programme also formed part of Creative Carbon Scotland’s culture/SHIFT programme which seeks to understand and promote the roles of cultural practices in addressing climate change and contributing to a more environmentally sustainable Scotland. A summary of the workshop activities and discussions as well as a list of participants is available in this short report. Cultural landscapes: Through the opportunity to learn about the archaeological and social history of the region, the workshop highlighted the cultural nature of landscapes and the need for a new culture of the Flow Country, which artists can play a role in shaping. We discussed the need for a wider cultural, political and social shift in consciousness of the importance of the peatlands in Scotland. Scientific and cultural ambition: We talked about the level of ambition in the scientific programme at the Forsinard Field Centre as well as the aspiration for the Flow Country to be recognised as a UNESCO World Heritage Site, and the potential for Forsinard to also be a hub for cultural research and innovation. This work could complement and contribute to the quality of scientific research and vice versa. Exploring complexity: Artists can bring more than just communication skills and translation of the facts to building of understandings and appreciation of the Flow Country. There is great potential for artists to contribute to exploration of the complex system of the Flow Country, and bring different ways of thinking about and imagining the future to help ensure its long term prosperity. Duty on public bodies: The Climate Change duty on public bodies which includes the third duty to ‘act sustainably’ could be explored by partner organisations such as RSPB Scotland and Scottish Natural Heritage through the hosting of roundtable discussions (similar to the workshop structure) which feedback to Scottish Government. This would also fit with the movement within climate change risk assessment towards a systems-led approach which is embracing a more generalist, collaborative approach rather than working in siloed disciplines. We are building on the positive conversations held during the workshop and hope to continue working with colleagues on the Flows to the Future project including with RSPB Scotland. In November we were fortunate enough to run a Green Tease event in Abernethy Nature Reserve owned and managed by RSPB Scotland with contributions from Collins and Goto Studio and we hope to run a Green Tease in Forsinard in due course! In the meantime, the learning from the workshop continues to inform our wider culture/SHIFT programme. The Flows to the Future Study Workshop was supported by the Heritage Lottery Fund and other supporters of the Flows to the Future Project. Please contact Gemma Lawrence at gemma.lawrence@creativecarbonscotland.com if you’re interested in finding out more about the workshop or Creative Carbon Scotland’s culture/SHIFT programme.